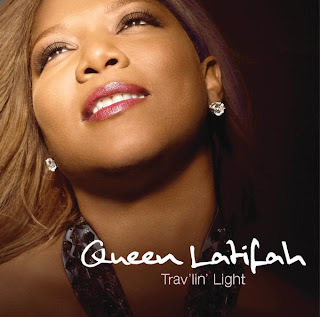 New Music: Queen Latifah - Travelin' Light | BlackRadioIsBack.com - Official Blog of the Syndicated FuseBox Radio Broadcast! Queen Latifah has a new Hip-Hop album coming out?!?! Anyway, she does have another jazz album, Trav'lin' Light through Verve and Flavor Unit Entertainment that's out. To be real honest, when she was first going in this direction a few years back with The Dana Owens Album, I thought the situation would be a bit nervous - we know she can actually sing without studio magic (check the song about her brother on the Black Reign LP - its pretty serious) but jazz is a whole different thing to get down proper - having the on point blend of technical vocal chops, improvisation AND feeling. Overall, I thought the album was pretty decent and this one is too. She didn't play around with the guests up on there (Jill Scott, Erykah Badu, George Duke, Joe Sample, Christian McBride & Stevie Wonder amongst other folks) and while some tracks would be unfair to compare to the original people who did them (music from Roberta Flack to Smokey Robinson is covered), the Queen holds her own. I'm glad Queen Latifah has been able to do multiple sides of the entertainment industry and music (movies, Hip-Hop, Jazz, Cover Girl Commericials, etc. ), but on the real, can we get a new Hip-Hop joint than that Order in the Court album (* cough * Black Reign II, please * cough *) especially since female MCs in the forefront of mainstream Hip-Hop are SORELY lacking and another Hip-Hop generation sitcom on regular TV that's not an embarassment?